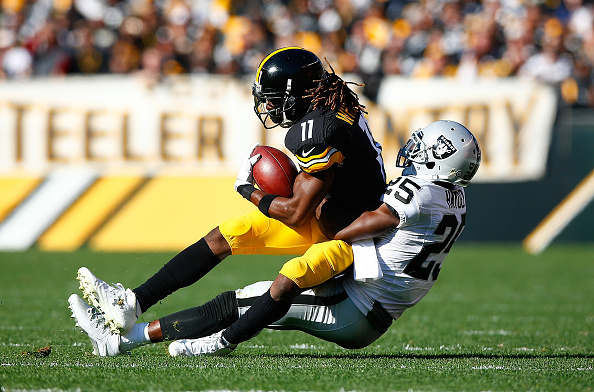 The Raiders seemed to overcome all day, yet in the end couldn’t stop Steelers WR Antonio Brown in the final minute, and lost a tough to swallow game in Pittsburgh Sunday 38-35. Chris Boswell hit an 18-yard field goal with four seconds left to win the game for the Steelers, who lost QB Ben Roethlisberger in the fourth quarter to a foot injury. Brown though was the story, as all he did against the Raiders was set a franchise record with 17 catches for 284 yards. His catch on a third-and-two from the Steelers 28 for 57 yards gave the Steelers the shot for Boswell’s field goal at the buzzer to win the game. 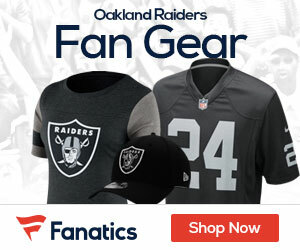 The Raiders rallied to tie the game at 35 with 1:15 to play when quarterback Derek Carr hit Michael Crabtree for a 38-yard touchdown. Carr threw for 301 yards with four touchdowns and a pick. Rookie WR Amari Cooper had 7 catches for 88 yards and a score, and Crabtree had 108 yards and two TD’s. Rookie running back Latavius Murray was knocked out of the game after a hit by Mike Mitchell which caused a fumble in the third quarter. He had 96 yards when he left the game. Give the Raiders credit, as Carr and company wouldn’t go away after the Steelers went up 35-21 in the fourth quarter. They attacked the Steelers secondary, driving down the field for a score as Jamize Olawale went in from 19 yards out to make it 35-28 with 9:37 left. After the injury to Roethlisberger, Carr and Oakland again drove down the field, but the Steelers got a pick in the end zone to keep the lead before the Steelers punted to put the Raiders in position to head down the field to tie the game in the final minutes. The loss drops the Raiders to 4-4 on the year, and breaks their two-game win streak. Next week is another tough test as they host the 6-2 Vikings.